Roger Hoefling - Shuttleworth Collection Flying Days, Flying Evenings etc. The Shuttleworth Collection, part of an educational trust, maintains its aircraft in airworthy condition at Old Warden aerodrome near Biggleswade in Bedfordshire. 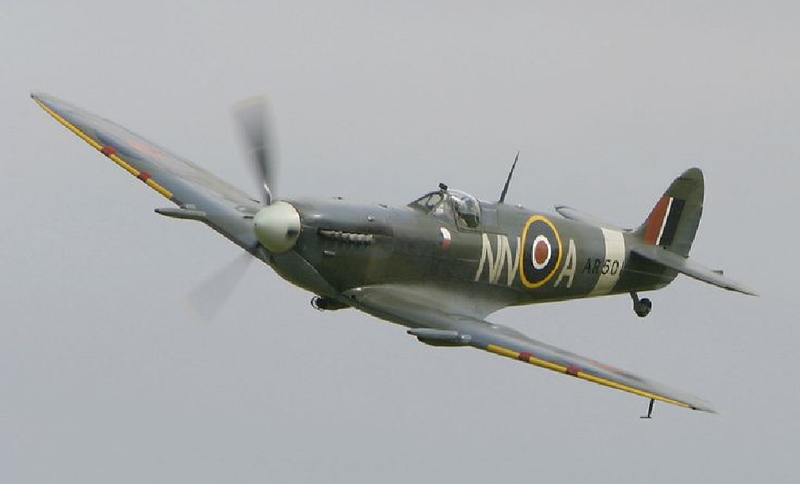 This is its Spitfire Vc, wearing the markings of 310 Squadron RAF with which it served in 1942-43. Evidenced by the roundel ahead of the cockpit, this was a Czechoslovak squadron, the first to be formed within the RAF. Roger Hoefling began commentating at Old Warden aerodrome in March 1971 at the Shuttleworth Collection’s first Flying Day that year. This followed a lunchtime conversation with Alec Lumsden, British Aircraft Corporation’s Press Officer, at BAC’s Head Office in London’s Pall Mall. Usually marking the start and end of each year’s UK display season, there were then ten Flying Days in the Collection’s annual calendar, taking place on the last Sunday of each month from March to October. Alec Lumsden had been the commentator for the 1969 and 1970 events but the travelling from Kent to Bedfordshire each time had registered. In response over that October 1970 lunch, Roger Hoefling offered ‘If you ever get stuck, let me know.’ No more was heard until Alec duly did the following March, saying ‘We feel you can do it’ in asking Roger to meet David Ogilvy, the Collection’s General Manger, to discuss it. In turn, that first Flying Day on Sunday 28th March 1971 followed, leading to Roger commentating at all of the Collection’s Flying Days until 1993. With Flying Evenings and Air Education Days latterly added to the calendar as well as events for such as the Transport Trust and Air Squadron, Roger has commentated at some 200 displays at Old Warden. See MEDIA COVERAGE: ‘Airshow 87’ 4.1987; ‘Flypast’ 11.1988 and 12.1988; ‘Pilot’ 3.1990; ‘Aircraft Illustrated’ 5.1996; ‘Aeroplane’ 12.2015.